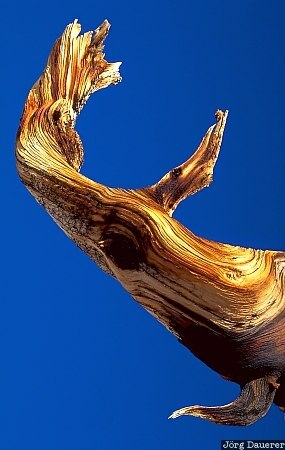 Silhouette of branch of a Bristlecone Pine at the high altitude of Ancient Bristlecone Pine Forest in the White Mountains with deep blue sky in the background. Ancient Bristlecone Pine Forest is in eastern California, United States. This photo was taken in the morning of a sunny day in October 2002.